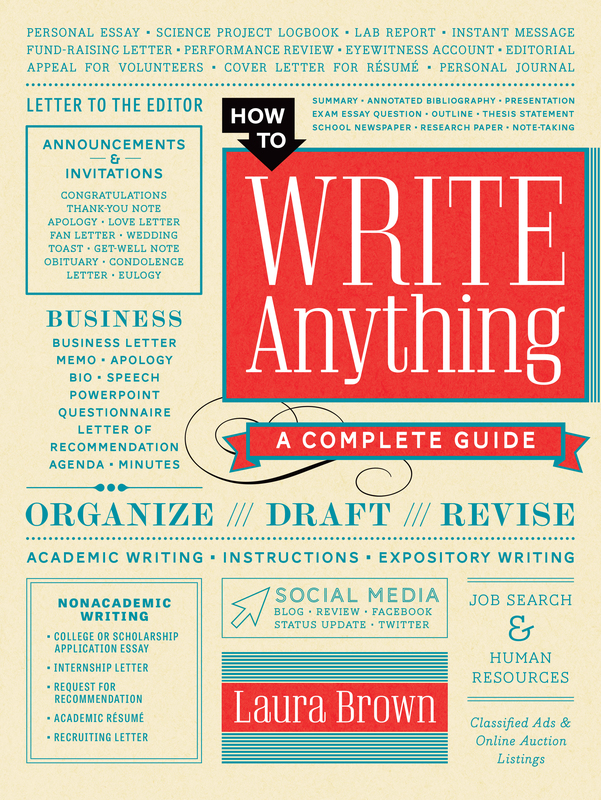 Laura Brown’s book, How to Write Anything: A Complete Guide (W. W. Norton, 2014), combines Laura’s writing methodologies with a comprehensive encyclopedia of nearly writing tasks, complete with model outlines, dos and donʼts, and examples—designed to help you get through all of lifeʼs writing tasks. Writing is more important now than itʼs ever been. At work, at school, in our personal lives— business and personal e-mails; online reviews and forums; proposals and reports; resumes and cover letters; blogs, Tweets, and texts—we’re all writing more than ever before. In spite of the increasing demand for writing, most people find writing a chore. Recruiters and hiring managers cite writing skills as some of the hardest to find, while high school and college instructors decry the decline in the quality of student writing. For many, writing is a painful task that produces poor results. Now thereʼs a resource for all these intimidated, reluctant, and ineffective writers: How to Write Anything will offer readers concise guidance and good models they can use to get all their writing tasks done quickly and painlessly. A comprehensive reference, How to Write Anything will be the only book the average person will ever need to get through all the writing tasks that life presents them. You can buy How to Write Anything here.